International Art Night is a series of multicultural performances and art forums. Join us, show your talent, connect with other artists, and enjoy a fun and relaxing night filled with art! 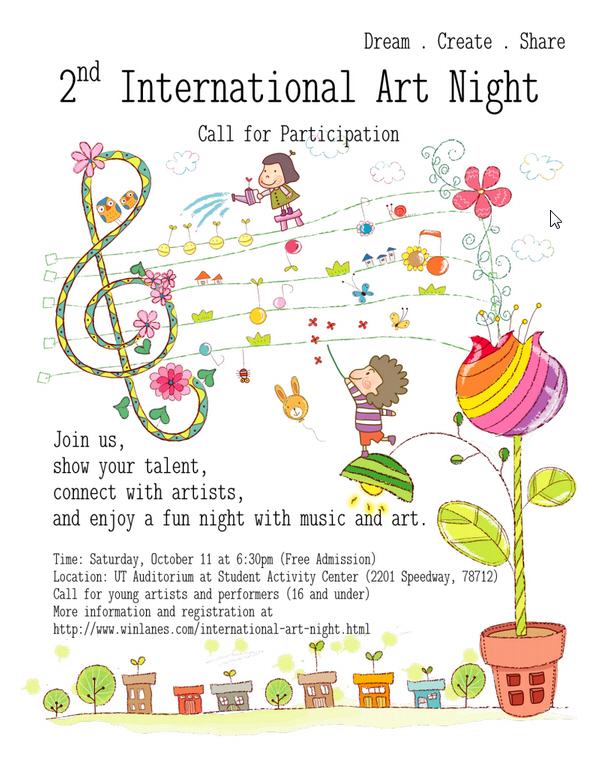 International Art Night is a series of multicultural performances and art forums organized by Winlanes Education. The event in 2015 is scheduled on September 19, 2015 at the University of Texas (UT Austin). If you have talent and would like to participate in the performance, please submit your performance through the 2015 International Art Night Perform5ance Registration Form. To promote international cultural communication, improve children's interests in art, this year's International Art Night will include a children's art contest. Submission is open from July 10th to Sep 8th, 2015. Requirements: any art work should be an independent creation that uses watercolor, oil painting, oil postal, soft postal, cartoon, or sketching. The size should be between 8'x10' and 14'x16'. Appraisal: All artwork will be uploaded to winlanes.com. The evaluation will be based on both public vote and the reviews by the professional artists. Participation and award certificates will be given on 10/13 during the International Art Night event night at UT Austin. Each child can submit one artwork. Each artwork will be charged $5 for the processing fee. You need to take a photo of the artwork and send to winlanes@gmail.com before Sep. 8, 2015. The original artwork is due by September 10, 2015. Please submit through the 2015 International Art Nights Art Contest/Exhibition Registration Form. if you need further information, please contact winlanes@gmail.com. The first International Art Night was held at UT Student Activity Center auditorium on 7/13/2013 in the theme of "The Stage for Youth".